Is the Wine Market Saturated? Is the wine market saturated? That’s the question a journalist asked me a few weeks ago. The query was provoked by the release of a study of the economic impact of the wine industry in Washington State, which noted that the number of wineries has reached 700+. Lots of wineries hereabouts and in California and the rest of the U.S. Lots of imports, too. Have we reached the limit? Is the market saturated? Well, it is a mistake to think of a market as a sponge that sits there waiting to be filled up. Markets are complicated and adaptable — they are literally living creatures because they are made up of smart, incentive-driven human beings. So their behavior is likely to be more complicated than empty versus full. Financial markets are a good example. 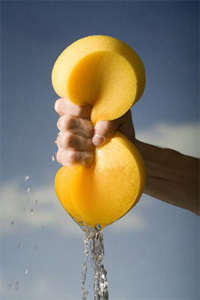 Scale is useful in financial markets, so it is not uncommon for finance to go through periods of consolidation, where the big get bigger and absorb (another sponge reference) the small. At some point you might worry about saturation. But as the big get really big, they always seem to leave gaps behind that smaller financial firms rush to fill. So a cycle of big creating opportunities for the little emerges. Financial markets cycles are more complicated than this, of course, and sometimes the sponge gets squeezed out in market adjustments, but I think you get the idea. The same dynamic process that seems to be filling the market in some ways is also leaving gaps for new entrepreneurs. It’s an interesting industry to study, but not necessarily a stable one to work in! Finance is a crazy business. Almost as crazy as wine! So what does this have to do with wine? Well, I see some of the same patterns. Here in Washington State, for example, I see some of that consolidation going on right now. Gallo has finally (because it was inevitable) entered the state as a producer, acquiring the venerable Columbia Winery and Covey Run brands. It looks like Gallo will invest heavily to revive and upgrade Columbia’s wines and historic brand. It’s less clear what will happen with Covey Run — some speculate that the brand will disappear but the valuable vineyards and facilities will continue to produce. Precept Wines is part of the consolidation pattern here in the Pacific Northwest, too. Precept has built and acquired a number of brands over the years — including the recent acquisition of Idaho’s Ste Chapelle — as it has established valuable scale and scope. Ste Michelle Wine Estates is also part of the trend. SMWE recently announced the purchase of O Wines, a maker of Washington Chardonnay. SMWE intends to add a red wine to the O Wines portfolio and take the brand national. At the same time that Washington wine has gotten bigger (and some wine brands are being squeezed out like water from a sponge), it’s very clear that other winemakers are finding opportunities at the opposite extreme of the market. Their wines will succeed (or fail) not so much because of national branding and economies of scale but depending upon how well they can achieve real quality and successfully attract a small but loyal (usually local) following. I wrote about Mosquito Fleet Winery a couple of months ago. This small Belfair, Washington winery has found a market for its excellent wines. The fact that the wines celebrate local history helps them connect to a particular customer base in a way that big brother wineries probably cannot. Another local winery — this one only a few blocks from The Wine Economist’s office in Tacoma — is also succeeding in a crowded market by stressing its distinctly local roots. It is called 21 Cellars for the simple reason of its location: in a cellar beneath a medical office on North 21st Street, just a short walk from the University of Puget Sound. 21 Cellars is a two person operation. Philip Coates is the winemaker and Katrina Lange is assistant winemaker. But job titles are essentially meaningless in an artisan operation like this one, where everyone pretty much does everything — and most of it is done by hand. Here’s how the website describes the operation. Fermenting in small lots with native yeasts, aging in French oak, and bottling unfiltered and unfined allows for highly structured and distinctive wines. Our limited production allows us to give more hands-on attention to each varietal, de-stemming by hand and using unique methods such as whole berry barrel-fermentation for our reds. Every bottle sold has been filled, corked, and waxed by hand, with labels designed by local artists. We are proud to present wines exhibiting creativity and longevity; showcasing the deep, earthy qualities of Washington’s premier vineyards. 21 Cellars’ roots go back to a home winemaking kit that Coates received several years ago. He caught the wine making bug and the rest is history if by “history” you mean lots and lots of hard work, constant learning and experimentation. Coates’s efforts were good enough to impress some picky vineyard owners, who agreed to sell him their fruit. (Reputation is key in wine and no vineyard owner wants his or her name on the label of a mediocre bottle of wine). We tasted the 09 Malbec and 09 Cab made with grapes from the Two Blondes vineyard, for example, which was developed by Chris Camarda for his Andrew Will winery. The wines we tasted were excellent, with real depth and balance. Production is modest (less than 500 cases per year) with sensible plans to grow in the future. 21 Cellars will get bigger, but not too big. They don’t want to outgrow the niche that they have so successfully begun to fill. 21 Cellars ruthlessly exploits (and that’s a good thing) its small scale, personal approach and local base with the same passion that Gallo and the others exploit large scale and national or global reach. Marketing is community based. 21 Cellars seems to take pride in supporting local causes and events, including the Washington State Historical Museum. The small and local strategy seems to be very effective. Their recent Semillon release sold out in three weeks! Is the wine market saturated? Well, it is crowded and competitive, that’s for sure. And some wineries and brands are certainly feeling the squeeze. But as in finance, it seems like there is always room for one more on the bus — if there is quality and commitment and if a legitimate local need is met. Thanks to Philip and Katrina for showing us around 21 Cellars and telling us their story. Thanks to Sue, Cynthia and Pierre for their work as research assistants for this project. An excellent post, it characterizes the market (and many other consumer markets) quite effectively, with one important exception. I take issue with one aspect of this post. Markets are not “literally living creatures because they are made up of smart, incentive-driven human beings,” as you claim. This characterization commits the fallacy of composition, i. e., the whole is not simply the aggregate of its parts”. A car is not merely the collection of its parts, a grape is not simply the aggregation of its molecules (or subatomic particles, to go further down the reductionist road). Grape molecules are neither sweet nor sour, yet, grapes are sweet or sour or somewhere on the sweet-sour flavor spectrum. Whereas, markets are complex and dynamic as are people, they are not “smart” or “incentive-driven” agents. Why is this point important? If you treat markets as intelligent agents, your explanations of outcomes will differ materially from explanations that are rooted in a characterization of markets as, say, complex systems or as random “walks”. Then, your predictions and descriptions, as well as the tools you use to reach them, of the mechanics of the market will differ, too. Economist Thomas Schelling made this point succinctly, tellingly and differently in his seminal 1978 work, “Micromotives and Macrobehavior”, with which I’m sure you are familiar. His point, after his investigations into the nature of segregation in civil society (racial, income, etc. ), is that the aggregated outcomes of individual agents (people, corporations, associations, nations, clubs, teams, etc.) acting independently with independent motives or purposes (not always the same) will differ from the intended individual outcomes. Hence, cities are segregated racially or by wealth not because of individual racism or economic status (“wealthism”?…-:)), but, for other reasons (more closely associated with the desire to live or work near others with similar values, behavioral norms and life outcomes) based on thresholds that each of us chooses (or, at least, employs in the decision process). By ascribing intelligence to markets, we encourage ourselves and others to ascribe capabilities to them that they do not have, and we encourage subtle forms of magical thinking. For example, markets do not “solve” problems in the way that engineers solve construction problems that derive from site irregularities, or as scientists solve the problem of repairing an orbiting telescope or educators solve the problems of illiteracy or innumeracy. More examples abound, but, I’m sure you get the point. This claim that “markets solve problems” pervades political, social and economic discourse and drives suboptimal (I’m being charitable, here) decisions about critical issues. As a writer and researcher, I’m sure you appreciate the importance of using language precisely to craft a fruitful narrative that will encourage productive thinking. As a subject-matter expert, I’m sure you appreciate the impact of your comments on a fairly wide audience. I encourage you to re-characterize the wine market in a more fruitful manner. Thanks for the very thoughtful comment! My pleasure. I like your blog; it’s informative and what you say matters to me. Speaking of niche markets, what do you think of online retailers like nakedwines.com (just got a Groupon offer, “$69 for $160 worth of wine”!). Their site says they “support independent winemakers across the world.” I’m nearly done with Wine Wars… Made me think of the globalization / terroir dynamics. What about the advent of a virtual wine wall, where you click instead of reaching up or down? (pardon, if you’ve already blogged about this — just point me there). Thanks for this, Roxanne. Although I wrote about nakedwines.com a couple of weeks ago, I haven’t done anything with the virtual wine wall. Very interesting … gotta think about this! I have often wondered about small wineries marketing, and my recurring solution obviously is not working at the present. I find restaurant wine prices silly, to say the least. Why would it not work for small wineries to contract with just a few, even one larger restaurant and be the featured house wine. I could see a restaurant offering 5-6 oz glasses of wine from $4-7 a glass. It would encourage a whole lot more (moderate) wine drinking and selling. Were this done, pricing and quality would likely settle into standard sorts of ranges. And I would often order wine with meals – as I do on the rare occasions I am in a town with an Olive Garden. They sell a great house/featured wine, as I learned from you. I am as outrages as you on the cost of wine at restaurants. That is true in Sweden as well. And here it is not even allowed to do BYO. Personally I therefore often drink beer…. Very interesting article. Is the wine market saturated? Well, it can depend wholly on who you are or what region your winery happens to be located. I mean when bottles of 1982 Chateau Lafite Rothschild are going for 2-3K per bottle as recently as a few days ago ( https://truebottle.com/index.html?searchterms=1982+Chateau+Lafite&action=search&bottlesize=3&region=0&timeframe=6 ) then a differentiation should be made between who in the market your wines have been designed to appeal to. It is as almost if some vineyards are selling wine, but then again something completely different. I see your point, Jason. But this also happens to depend on the wine/vintage you happen to be selecting. For instance, while you show prices for the ’82 Lafite going up, at the same time it seems that prices for the ’90 Mouton have been going down.